We are excited to announce that we have joined forces with General Electric (GE) to release the innovative “GE Drop Science Pack” into djay 2. The unique pack is the byproduct of GE’s recent partnership with famed musician Matthew Dear to create “Drop Science,” a new electronic track based on sound samples from GE research centers around the world. djay 2.6 also introduces an updated Spotify integration, now allowing users to mix in key from their Spotify library for an unprecedented mash-up experience, and adds support for the new Pioneer DDJ-WeGO3 MIDI controller, featuring an optimized user interface that is tailored precisely for the hardware. 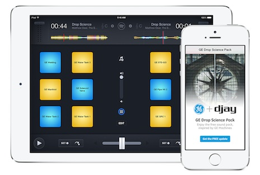 djay 2.6 is a free update for all existing users of djay 2 iPhone and iPad, and now available on the App Store for iPad and iPhone. We are excited to announce our collaboration with Pioneer on the next generation compact DJ controller DDJ-WeGO3 for Mac, iPad, and iPhone. The DDJ-WeGO3 comes with all the easy-to-use features of the DDJ-WeGO2, plus it charges the iPhone/iPod touch/iPad while it plays. The latest addition to the DDJ-WeGO series gains a durable, stylish aluminium top plate and is available in black or white. It is lightweight and small enough to fit in a backpack, so you can give spontaneous performances wherever the party takes you. The Pioneer DDJ-WeGO3 will be available in October. 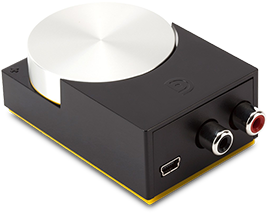 We are excited to announce the availability of Griffin DJ Connect, a multi-channel audio interface designed for djay for Mac, iPad, and iPhone. To seamlessly mix the playing track into the next track, you need to be able to pre-listen or cue the next track in your headphones to make sure it’s beatmatched and sounding great in your mix. Created specifically to work with djay, DJ Connect allows you to pre-cue your music with separate dual stereo outputs and additional volume control for your headphones. Voting is now open and will close on July 31, 2014. Please support djay and VOTE NOW on Facebook. 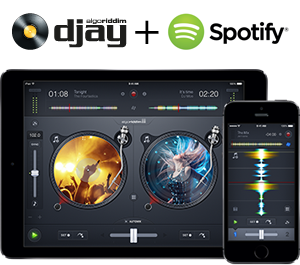 We are excited to announce our partnership with Spotify and a major update to djay for iPad and iPhone. With this latest release of djay 2.5 – a free update for all existing users of djay 2 – you can now mix over 20 million songs from Spotify on your iPad and iPhone. djay 2.5 also introduces Match, a revolutionary tool for DJs powered by The Echo Nest that recommends tracks that go well with what you are currently playing and helps you find the perfect next song. Or want to lean back with a perfect music mix at your next party? The all-new Automix Radio in djay 2.5 automatically picks songs from Spotify that go well with each other and mixes them for you. Step away and enjoy live DJ mixes based on your personal musical taste, all with the simple tap of a button. Note: Spotify access in djay requires a Spotify Premium account. A free 7 day trial of Spotify Premium is available to all users of djay 2. Moreover, this major update brings you a variety of new features and improvements including an all-new audio FX section, over 30 new desktop-class audio effects powered by Sugar Bytes and available via In-App Purchase, plus an amazing free sample pack by House DJ veterans Milk & Sugar. 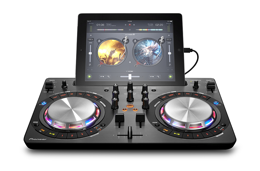 Learn more about djay 2 with Spotify, or get it now on the App Store for iPad and iPhone.